The rich history of South Africa’s Soweto derby is about to be revisited this coming weekend as Kaizer Chiefs host old time foes, Orlando Pirates in the final derby of the season at the iconic FNB Stadium this weekend. Saturday will be the 71st meeting between South Africa’s two oldest rivals with the first fixture dating all the way back to 24 January 1970. Since then, the fixture has been a sought-after affair that splits the nation in two and has even transcended over the African borders. Quite recently, Orlando Pirates’ popularity was evident when they enjoyed overwhelming support in Zimbabwe when they faced FC Platinum in the Total CAF Champions League group match which ended in a 0-0 stalemate. While Kaizer Chiefs have enjoyed more success in this fixture, it is the Buccaneers who have been coming out victorious of late. The last time Chiefs had one over their rivals’ was back in 2014 in a 2-0 victory under the then stewardship of Stuart Baxter. Since then, the results have not been forthcoming for the Glamour Boys who have been no match for Pirates’ tactical approach in this highly staked fixture. The last three encounters between the two Soweto rivals went 2-1 in favour of Pirates who are now unbeaten in 11 matches against Chiefs. If the history books are anything to go by, Amakhosi will take solace in the fact that under coach Ernst Middendorp, the club has never lost against Pirates. 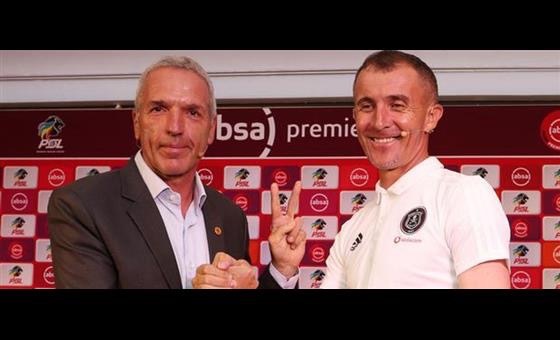 During his tenure between 2005 and 2007, Middendorp won three and drew one against Pirates and will be hoping to maintain this unbeaten run against their foes. Speaking ahead of the encounter, Middendorp said the recent defeats against Pirates is not something he has discussed with his charges but opted to focus on the team’s strengths. “I haven’t really spoken about it (defeats) at all. At the moment, I don’t have to calm anyone down. I don’t have to motivate and I don’t have to put something in place. Everybody who is part of this journey should be ready to prove what he can bring out and be a little more than in a normal game” said Middendorp. Amakhosi are expected to give new signing, Daniel Akpeyi the nod following the inconsistency of Namibian keeper, Virgril Vries. The recent acquisition of former striker, Shaun Bartlett to the Amakhosi technical set up could also be the much needed solution to their goal scoring drought. Meanwhile Pirates coach, Milutin Sredojevic, who also has his eyes on the Champions League cautioned against looking too much into previous results against Chiefs. Kick off at the FNB Stadium is at 15h30.